There are 12 electromagnetic anomaly “triangles” or “hotspots” on Earth known as the “vile vortices.” The “Bermuda Triangle,” off the Bimini Coast east of Miami, Florida, is the most well-known. Here ships and planes have mysteriously disappeared or reported experiencing strange instrumentation malfunctions, sudden electromagnetic storms, disorientation, and even time loss. 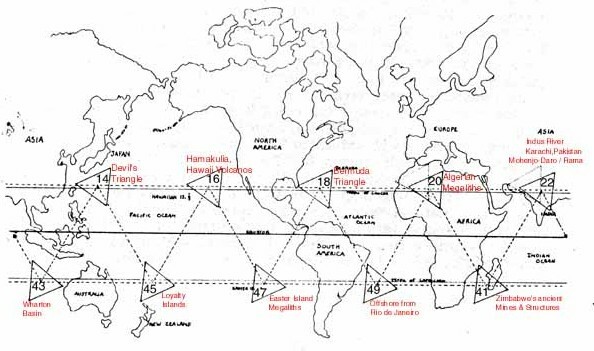 Few people are aware that these 12 electromagnetic spots are evenly placed around our planet in a grid-like pattern set along two distinct latitude lines. The popular assumption would be that they are naturally there to stabilize the Earth’s rotational axis. But one has to ask oneself—could nature lay a grid work that precise on its own, or did it have a little help? The 12 vortices were brought to the world’s attention by biologist and science writer, Ivan T. Sanderson, in the early 70’s. The History2 Channel, under the guise of a “documentary,” did a rather hokey 2014 re-dramatization of “The 12 Devil’s Triangles” based on scientists discovering that these vortices contained an intelligently placed grid work of strange elements that were rare to Earth and almost impossible to deconstruct. Despite the over-acting and melodramatic script, the question still remains. If there is an intelligent design behind these vortices, then who put them there and for what purpose? This very question led me to the work of the great 20th century physicist, Nikolai Kozyrev and Russian medical doctor, Alexander V. Trofimov for some answers. Trofimov, inspired by Kozyrev, has done some groundbreaking research in the field of human consciousness and magnetic fields. As for Trofimov, his work consisted of “remote viewing” experiments across both distance and time. He discovered that results were more positive when the “sender” was in the far north, where the electromagnetic field is less powerful [away from the 12 vortices]. So he and his colleagues invented an apparatus that would shield their subjects from all local electromagnetic fields in order to reliably access all place and time — past, present, and future — instantaneously. Based on “Kozyrev’s Mirrors,” invention, it reflected thought energy back to the thinker and the results were astounding (see video below). 3) that once a person has accessed these altered states, his or her consciousness remains so enhanced. According to recent scientific data, something is causing Earth’s electromagnetic field to decrease. The Earth’s magnetic field currently has 49,000 nano-Teslas (a unit of magnetic flux density). It has been decreasing by about 50-70 nano-Teslas per year. By the end of the millennium, they predict we will have only 100-200 nano-Teslas. This decrease and/or disturbance in our electromagnetic field could be why animal behavior and migration patterns, influenced by such fields, are changing. With regard to human brain activity, it becomes even more interesting. When assessing brain functions like intellect level, memory, and other functions, findings shows we currently use only 5% of the capacity of our brains throughout our whole lives. Trofimov experimentation showed that when their subjects spent some time inside a space without electromagnetism, post-testing showed a drastically different picture. They discovered that our mind’s additional reserves and abilities are activated. They saw an increase in memory capacity, increased IQ, and changing zones of electric activity of the brain. This tells us that when the electromagnetic field is decreased, we see an increasing ability to use the reserves and capacity of the human brain. When a person is totally shielded from electromagnetism, brain function is in direct correlational dependency not only with solar energies, but with galactic rays. In other words, it directly opens a conduit to information from the galaxy. It increases cosmic awareness. As a result, we begin desiring to reconnect with our inter-galactic brotherhood—to discover worlds beyond our own. Is it any wonder that now, more than ever, people and reputable organizations (i.e. Sirius Disclosure and Paradigm Research Group) and are pushing for full government disclosure of the extraterrestrial presence and our true origins. The mechanism by which cosmic human consciousness is currently being opened, appears to correlate with the decreasing electromagnetic field. If this is true, and I don’t claim to have all the answers, then we are lifting the veil. We are the builders of planetary change–both literally and figuratively.